Jonkershoek Nature Reserve is about a one-hour drive from Cape Town CBD just outside Stellenbosch. It’s a popular venue for mountain bikers and hikers offering a valley of mountains to explore with two main waterfalls (Eerste and Tweede Waterval) and a flowing river. We did the 17km Panorama hike around the Jonkershoek Nature Reserve for a friend’s birthday which took us about 5.5 hours. It started with a steep ascent up to the contour path below the Banhoek peaks to the Bergriviernek (which is a sort of a saddle). 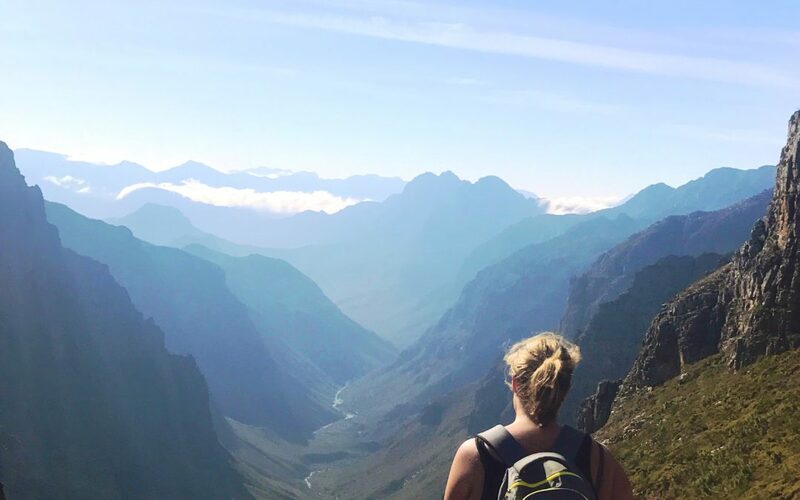 The Bergrivernek offers views down the Jonkershoek range but with the most impressive being down the sprawling valley of Assegaaiboskloof. Because it was a friend’s birthday, some-one hiked with gluten-free vegan cupcakes (as people from Cape Town do). They were chocolate, rich and decadent. The birthday girl had also baked choc chip cookies (not gluten free or vegan but equally yum) which we dipped into the leftover cupcake chocolate icing. I’m not used to such home baked indulgences on a hike (or in everyday life because I never bake) and I was super impressed with the ladies who trekked them all the way up the mountain. After an incredible sugar high, we then continued along the picturesque Dwarsberg plateau, with streams surrounded by disas, to Kurktrekkernek. The views continue to be breathtakingly beautiful. The descent down Kurktrekkernek back into the valley was not fun. There were loose rocks everywhere and it felt like we were just involved in the process of aiding erosion and surfing down as opposed to following an actual path. But at the bottom we were rewarded by the two waterfalls and a gentle walk next the river. There is a much easier 1-2 hour hike to these two waterfalls which is relatively flat and recommended for non-hikers. You can drive quite a bit further into the reserve from the entrance gate to the starting point of the hikes. A 4x4 type vehicle or one that can take some knocks is recommended. I wisely left my delicate car at the gate and caught a lift with friends.